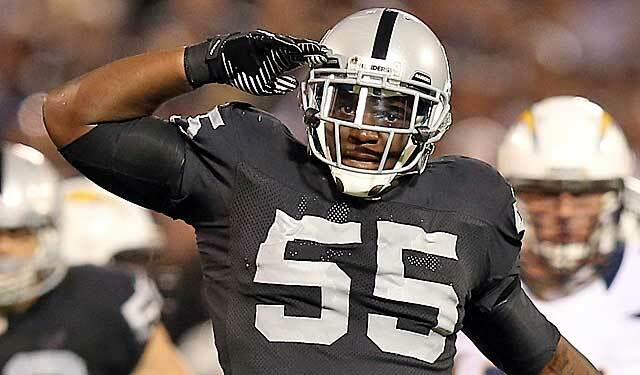 It appears that Rolando McClain’s rap sheet will be longer than his NFL playing career. McClain reaffirmed my previous statement, that the Ravens shouldn’t rely on him. Rolando McClain notified Ozzie Newsome that 35 days after he agreed to a contract with Baltimore, he’ll be hanging em’ up at age 23. The Ravens took a chance on the troubled young man, signing him to a $700K contract with no money guaranteed. It didn’t take long for McClain to find himself in trouble with the law after signing with Baltimore. The team wanted McClain to basically stay away from OTA’s until his July 9th court date where he faces charges of disorderly conduct and resisting arrest. Thanks to Rolando, the team’s decision is that much easier on where to go at MLB. Second round draft pick, Arthur Brown of Kansas State, steps right in to the top spot on the depth chart as Jameel McClain’s health is still in question, and possibilities of Courtney Upshaw moving to inside linebacker still open. Arthur Brown, Courtney Upshaw*, Jameel McClain*, Albert McClellan, Josh Bynes, Bryan Hall. Daryl Smith – ESPN grade, 81. Nine year veteran of the Jacksonville Jaguars and he’s their franchises all time leading tackler at 31 years of age. Until 2012 he only missed four games in his entire career. He sat out most of 2012 until week 16 with injury. Nick Barnett – ESPN grade, 81. Long time Green Bay Packer, recently cut by the Buffalo Bills after two years there. 1,029 tackles for Barnett in his ten year career, including 20.5 sacks and 12 INTs. An All-Pro in 2007. Brian Urlacher – ESPN grade, 80. Maybe the guy has some gas left in the tank, as he prepares for his age 35 season. The numbers are Hall of Fame worthy with 40+ sacks and 20+ INTs, to go along with 1300+ tackles. However he hasn’t notched a sack since 2010. Leadership is something this guy can bring to a defense with a lot of new young faces. The question may just be how much money is Urlacher asking for. Like the Ed Reed situation, does Urlacher want to be paid like one of the top five linebackers of the last decade, or will he settle for what he’s worth as a 14-year veteran stopgap with durability issues? He has all the accolades one can have, with the exception of a Super Bowl ring. The Ravens give him just as good chance as anyone to accomplish that goal, so maybe he’s willing to take less money to have a chance to reach the top. Some other guys the Ravens could pursue include: Leroy Hill (SEA), Takeo Spikes (SD), Rocky McIntosh (STL), Bradie James (HOU), Will Witherspoon (TEN), Scott Fujita (CLE), Keith Brooking (DEN).